I am so passionate about buslife, there are times I want to shout it from the rooftops (bus tops?). I think this lifestyle would work well for a lot of people, and based on the amount of interest, I think I'm right. I know that budget can be a big deterrent for a lot of people, and I completely understand. I would like you to know that I spent approximately $5500 total ($2500 for the bus, $1000 for the solar, and the balance for the conversion), to make Cozy a reality. Considering I was paying $1400 a month on rent, I recouped that investment very quickly. There are lots of fantastic resource available to tell you how to make a skoolie of your dreams, and I'm not qualified to guide you in that department. However, if you want to make this happen, and your budget is super tight, I'm your girl! I had to figure out ways to stretch every penny, but I didn't want to compromise style. In the end, I think a lot of these money saving strategies are part of what gives Cozy her personality. So here are some tips, in no particular order. Take what works for you, or just use it as a guide to create your own ideas, or if you're among the lucky ones with an unlimited budget, perhaps consider some of these ideas as environmentally friendly options, or a way to add some unique character to your build. 1. Architectural salvage - Cozy has a number of elements that came from architectural salvage sources. The mini farmhouse sink came from Habitat For Humanities ReStore, which offers an ever-changing inventory. I found it to be rather hit and miss, but on a good day it can be an amazing source for building materials. ReStore often has a lot of brand new, or barely used, items, but vintage salvage stores can also be a great resource. Treasures from vintage salvage stores, thrift shops, and barn/yard sales can add a lot of personality to your build. My favorite vintage architectural salvage store is Ohmega Salvage in Berkley California. 2. Reuse - You would be surprised how many things that you already have can be reused. I was going to build an art/everything table in Cozy, until I realized I could reuse the art table that I'd had for many years. I had to adjust some of my measurements to make it fit, and the table sacrificed a leg, to fit over the wheel well but it worked, and I'm so happy to have that part of my journey as an artist included in my bus. Look around, be open minded, you may be able to save yourself from buying something new, if you can make something you already have work. 3. Repurpose - The perfect example, to illustrate this, is palette wood. It's everywhere! Readily available, it can require some extra work, breaking apart the palettes, but free wood, loaded with character, it's a great resource. 4. Consider the season (possibly delay) - Once you get in your home on wheels, your financial situation will likely improve, and you will be able to add some things that you would really like to have. I suggest considering the first season you will spend in your bus, for example, if you're beginning buslife in the winter, prioritize a heater, and perhaps you can delay the fan. This was my situation, I ended up adding my ceiling vent/fan long after my build was finished. Was that the most practical order to do the project? No, it really wasn't! However, it got the job done, in a financially comfortable fashion. Maybe you can delay getting a heater, window screens, etc. Give it some thought, not everything needs to happen before you move into your bus. Get the basics in place, and then go from there. 5. Think outside the (big) box (store) - Look around, everywhere you go, for ideas. I would walk into that giant building supply store and think everything needed to come from there. They had everything! Simple, one stop shop. However, that wasn't always the most economical way to do things. If you find a great deal on something, use your imagination to think of "off-brand" uses for that item. I found great stuff at nurseries and office supply stores. Always check the clearance aisle, in any kind of store (including the big box building supply store), you might be surprised what you will find! Then look at it with a side-eye, and think what are all the possible uses for this item? My favorite example, in Cozy, is that I used doors for the walls. 6. Really think minimally - I love the wood ceilings, that a lot of people do, in their skoolies! I really wanted to do that too, but my budget said no. So, I had to think of alternatives. What was the least I could do? Paint it. I pondered that for some time, but I did want some insulation. The second minimal solution I thought about was just putting Reflectix up there. But I wanted something pretty, so I glued on the insulation and then covered it will inexpensive embossed wallpaper. That ticked all the boxes - inexpensive, insulating, and pretty. Another minimal idea that I implemented was just doing a "wash" of paint on the exterior of the bus. I used less than a quart of paint on Cozy's exterior. Ultimately, I may repaint her, but for now, it was a very low cost solution to altering her school bus appearance. 7. DIY it - If you can't afford it, figure out how to DIY it. Someday, maybe a Natures Head Composting Toilet will be part of my life, but in the meantime, I had to get creative. I looked into buying a urine diverter to build my own composting potty, but that too was on the expensive side (for basically a funnel), so I spent many a night trying to figure out a better way, and eventually I came up with one. See this blog post for complete, step-by-steps instructions. I have an easy to maintain, environmentally friendly, virtually odor-free , potty for under $20 bucks! 8. Keep it simple - Think about things you are willing to simplify. Water, lighting, and cabinetry were areas that I totally lacked building confidence and budget, so I kept them as simple as possible. For water, I have a hand pump marine faucet, a 5 gallon fresh water bottle/tank, and a 5 gallon gray water bottle/tank. Would it be nice to upgrade? Sure it would, but this really works just fine, and I can always upgrade later if I choose to. For electricity, I have my Goal Zero Yeti, but for lighting I just have some solar powered fairy lights, and some battery operated task lighting. I probably couldn't paint or create, at night, with this lighting, but it has a lovely ambiance. For kitchen storage I opted not to have cabinetry in Cozy, and went with simple shelving, and inexpensive drawers, covered with a linen curtain. Again, keeping it simple and inexpensive. 9. Look to nature - One word - birch! I love how all the natural wood brought so much character to Cozy. Look around in nature, there is so much available, and get creative. 10. Upgrade later - I've been in Cozy for nearly two years now, and I've been using a high-efficiency cooler. I look forward to upgrading to a little refrigerator soon, but my little cooler has served me well in the meantime. Before I had my vent/fan I used a little box fan in the window. Think about what you can do to get by, and then upgrade later. 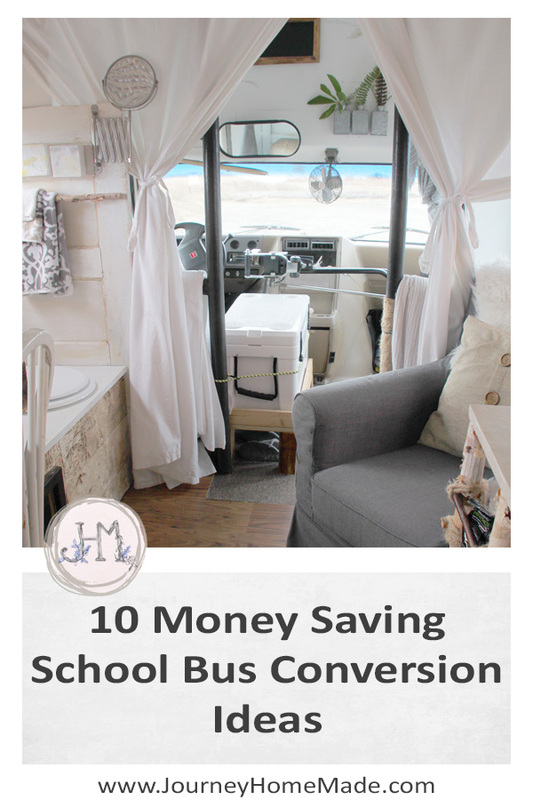 So, there you have it, ten of my favorite money saving skoolie building ideas. Please feel free to add your own ideas to this list, I'm all about helping people find a way to begin living this lifestyle, if they choose to.